This coffee has a pleasurable flavor and intense body. 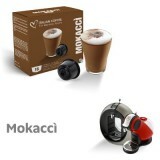 Its distinctive, everlasting taste is incomparable to other coffees. 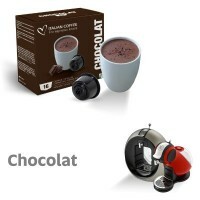 It is an excellent choice for everyday coffee and it is adored by all coffee lovers. Best Es..
A revolutionary coffee, full bodied and with an intense aroma. On the palate, this outstanding 100% Robusta blend is reminiscent of toasted almonds and chocolate. Best Espresso capsules for Dolce Gusto® system 100%&n.. This coffee is made of prestigious Arabica. Delightfully, smooth and classy flavor, it will leave to you a pleasant taste. This finest quality coffee can be enjoyed any time, morning breakfast, moon or night. 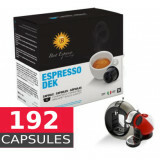 Best Espres..
Value Pack containing 192 (12 packs of 16capsules) high quality Coffee Capsules compatible with all Nestle Dolce Gusto Machines. Capsules come in a 16-capsules sealed pouch and are patented and certified to .. Delicious chocolate ready to drink. This drink is already sweetened, creamy and tasty. Indulge yourself with a hot chocolate at anytime during the day.Italian Coffee capsules for Dolce Gusto® system 100% Made in It.. The wait is over, Real Espresso in capsules compatible with all Dolce Gusto Machines is here. 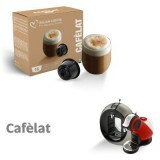 Sign up for free to receive discounts and to be first to know about new products. 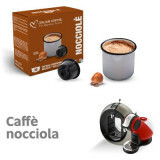 Compatible with all Dolce Gusto Machine including: Circolo, Creativa, Fontana, Jovia, Genio, Esperta, Melody, Mini me, Oblo and Piccolo. Our lemon tea is a blend of carefully selected black tea extracts. A refreshing, delicate and rounded tea with the fresh taste of lemon, it is perfect for any time of day, from breakfast to tea time. Best Espresso capsul..
Our ginseng coffee is a blend of Ginseng and instant coffee. An easy to drink beverage with a unique taste and extraordinary revitalizing properties. Try it out! 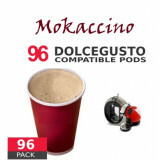 Best Espresso capsules for Dolce Gusto® system 100%&nb..
A decaffeinated coffee made from a blend that includes excellent Robusta. This results in a stronger, more creamy and more intense coffee. A decaffeinated coffee dedicated to espresso lovers.A rich, delicate blend that c..
Amazing unsweetened and creamy Café au lait drink. Only natural ingredients without added sugar are used for this blend. Contains caffeine and is perfect anytime of the day. 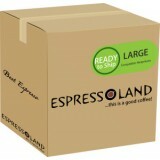 - It contains instant coffee - Italian Coffee .. Delicious Cortado Coffee macchiato very creamy and no sugar. 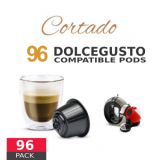 Italian Coffee capsules for Dolce Gusto® system 100% Made in Italy quality - The best drinks in capsules come in a 16-capsules sealed po.. Instant short macchiato cortado coffee!Delicious Cortado Coffee macchiato very creamy and no sugar. Italian Coffee capsules for Dolce Gusto® system 100% Made in Italy quality - The best drinks in capsu..
Mocaccino is an amazing invention, coffee, milk and chocolate in a unique breathtaking sweet drink to give you the right boost of energy.Italian Coffee capsules for Dolce Gusto® system 100% Made in Italy quality&nb..
Mokaccino, an amazing invention!Mocaccino is an amazing invention, coffee, milk and chocolate in a unique breathtaking sweet drink to give you the right boost of energy.Italian Coffee capsules for Dolce Gusto® system 100..
Hazelnut coffee is an amazing sugar free drink. 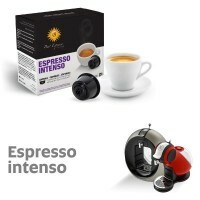 Enjoy at any time of they day.Italian Coffee capsules for Dolce Gusto® system 100% Made in Italy quality - The best drinks in capsules come in a 16-capsul..
100% Organic Arabica Coffee from Mexico. This blend is made of high quality beans for a fruity, slightly acidic, light and delicate taste. 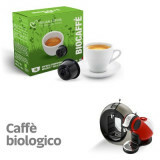 Italian Coffee capsules for Dolce Gusto® system 100% Made in Italy .. Fantastic Cappuccino made of natural ingredients with no added sugar. 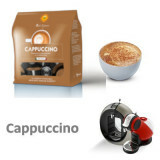 This cappuccino has delicate, velvety and thick foam that cappuccino lovers will adore. Only the finest quality ingredients are used for the mos..